Hello out there , beautiful people. Joe here, the Michigan Guy-at-large. 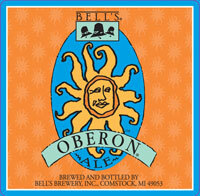 I was in Cleary's Pub in Howell on Monday night, and the first sign of spring was there -- Bell's Oberon. Now, if the snow would just stop falling, I can get down to some serious snoozing-on-the-patio chill'axin'. By the way -- Cleary's (on Grand River, east of Mich Ave) has half-off on pizzas on Monday nights. That's $7 for a large pepperoni. And it may be the best pie in the L.C.